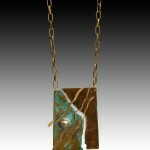 I love creating beautiful things with metal and stone. 3-D art is my passion. I have been interested in 3-D compositions as long as I can remember. Arranging, re-arranging and assembling compositions from any material that interested me that I found exciting. My father was an architect, so when encouraging my work, design was always important. I still remember my first art project in high school was a seed-pod necklace made from seed pods from the cotton wood tree. After graduation, I pursued a BFA degree at Washington University in St. Louis for 3 years when I left to marry Byron Foust, also an architect. Now married, gardening and creating fabulous landscapes and arrangements in nature became my new media. I loved the artistic challenge even more than anything I had done before. I enrolled at Southeast Missouri State University and majored in Horticulture. I Became very active in my local garden club. and started entering and winning awards in local, district, and state flower arranging competitions. I am now a Master flower show judge for National Garden Clubs, a Master Gardener, and have held several state positions in the Federated Garden Clubs of Missouri.. I also was having success in crafting and selling unique art objects from gourds. When the Famous Barr Mall opened in Cape Girardeau, I did seasonal work with the Visual Arts Dept. for Famous. I discovered a new application for my talent. I then became the permanent display manager for Seiferts Women’s store for 12 years. A new challenge presented itself when I was asked to become a buyer and retail sales manager for Cape Garden Supply. Requests for personal service from customers led to me starting my own interior plant service, ‘Green Gardens Interior Plant Service’, which I still operate. 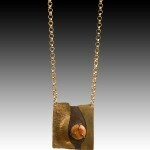 Jewelry: Through all of my artistic ventures, I was always repairing, creating, and making jewelry. 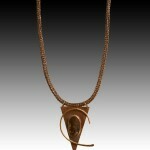 My love of nature led me to my first bead show, where the diversity of materials to work with’ hooked ‘ me. I set up a studio and let the magic begin. Sales at local art shows encouraged me enter juried shows and successes there led me to attend summer classes in metalsmithing at William Holland School of Lapidary Arts, in Young Harris, GA. the last three summers. I am now focused on creating interesting contemporary designs with combinations of metals and organic materials that reflect the culmination of my personal approach to composition. 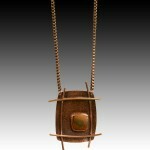 In 2012, I won the Best of Show booth award at the SE Council of the Arts Christmas show.